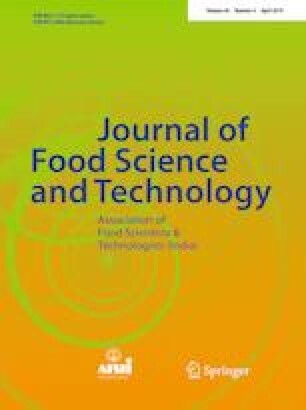 In order to prolong the shelf life of Chinese traditional dry-cured meat products, a pulsed ultraviolet light (PL-UV) irradiation method was adopted to treat meat products according to the following parameters: pulse energy of 8 J, 300 pulses, and an effective exposure distance of 10 cm; the UV light irradiation power of 6 W, an effective exposure distance of 11 cm, and an exposure period of 5 min. After a pulsed ultraviolet irradiation, total bacterial count in dry-cured meat decreased from 6.89 to 4.53 lg (CFU/g). The number of Micrococcus and Staphylococcus in samples decreased from 6.49 to 4.10 lg (CFU/g) and the number of molds and yeasts decreased from 5.45 to 4.28 lg (CFU/g). The number of Lactic acid bacteria increased from 3.97 to 4.55 lg (CFU/g) and Escherichia coli was not detected. Total colonies, target bacteria, peroxide value, thiobarbituric acid-reactive substances, water activity, T2 relaxation time, pH, color difference, total volatile basic nitrogen, and the sensory evaluations of dry-cured meat products after PL-UV treatments were determined in a 30-d storage experiment. The shelf life of dry-cured meat treated with PL-UV irradiation at 20 °C was predicted to reach to 294 d by applying of shelf life testing method accelerated. The quality and safety of dry-cured meat treated with PL-UV irradiation was better than that of untreated samples. This work is supported by the Natural Science Foundation of China (31660496), the Talents of Platform in Guizhou Province, China (5662), the Excellent Graduate Student Program Of Guizhou Province, China (6004-2), the Guizhou Graduate Special Food Processing Innovation Workstation, China (JYS009), and Project of the Innovation Fund for Graduate Students of Guizhou University, China, Research Engineer (2017023).